The video stirred up nearly as much controversy as it did positive attention for the cause. Almost as soon as the video began to achieve a “viral” status, criticisms about the organization surfaced. Critics chastised Invisible Children for being more interested in raising funds then helping the citizens of Uganda. Others question the laser focus of the video for over-simplifying the conflict in Uganda. And then came the great moment of shame: Co-Founder of Invisible Children Jason Russell, the architect of the video suffers from an undeniably curious spell of erratic behavior due to “exhaustion”. How did, arguably, the single most successful on-line marketing effort in history backfire? Invisible Children forgot the number rule of marketing—you must deliver on what you promise. When studying Uganda between the mid-1980’s and now it is impossible to miss the impact that Joseph Kony, head of the Lord’s Resistance Army (LRA), had on the culture. Reports estimate he has displaced two million people and abducted 66,000 into military work since 1986, many of them children. As the head of the LRA he has been officially charged with war crimes but has evaded capture. Enter: Invisible Children. Its founders visited Uganda in 2005 and were moved by the conditions faced by the Ugandan people—particularly the children. They created an organization designed to create a more secure future filled with opportunities for these young people. Just prior to release of the video they had achieved one of their key milestones—getting the U.S. military to commit resources to find Joseph Kony and end his paramilitary group once and for all. The video was designed to build on this success and create a broader base for their movement. And initially it did, the message in the video was very “sticky”. Despite the negative attention the video and the efforts of Invisible Children received the viral success of the KONY 2012 cannot be ignored. Or can it? The KONY campaign perfectly targeted its key demo of young adults with the 29 min long video. That’s the ‘War and Peace’ of the Internet, okay? Using short clips, vignettes, poignant visuals and compelling, if not addicting, music they were able to get and hold the viewers attention. Like a hungry python. The KONY video was nothing but a series of simple messages. One of the key messages being “Nothing is more powerful than an idea whose time has come.” Ultimately the video made the most simple and visible message “Make KONY famous”. While this was not the single most important element of meeting their goal(s) it became the rallying cry for their movement. Had they tried to sell the whole, more complicated, story they would have failed. The video gets your attention quickly transitioning between a theme of connectivity and a scene of a childbirth. This transition gets you emotionally invested and engaged. You want to see what comes next. Your curiosity is piqued. The ability to make abstract concepts tangible to the viewer concretes the rallying point. There is a sense of urgency created by putting an “expiration date” on the video. This creates a point in time for users to rally around. A concrete action they can take. Together. The call to action is limited to arresting Joseph Kony. This concrete goal is actionable and attainable. Invisible Children shows you how. But, by this time, actually improving the lot of Ugandan children depended very little on capturing Kony as he had largely left Uganda. If their goals are seen as unattainable they lose all of their credibility Invisible Children showcases their ability to succeed by showcasing how they got the U.S. military involved . They further instill credibility by intimating an effect on an international board of authority (International Criminal Court – ICC). In doing so, they galvanize a largely disaffected group of young people to believe they can make a difference by pulling together. “A bunch of little’s” could make a big difference. The emotional nature of the video hits you hard and immediately. The children are the hook. The point at which that hook is set? When Jacob (the young man highlighted throughout the video as an example of Kony’s efforts) says to Russell that he would rather die than live under the current environment. Having created credibility they build on this emotional connection and introduce a WIIFY (what’s in it for you) – by getting people to see themselves as part of the solution. They provide a variety of simple and easy ways to improve the lives of children like Joseph/Jacob and have real impact. This story further demonstrates that a bunch of “littles” can in fact, make a “big”. How Did the Success Fail? To say this video was a viral success is an understatement. It has been named the most viral video in history. With over ~200 mill views it can certainly be said to have spread a message. The message promoted in the video is simple and concrete contributing to one of the most successful viral marketing campaigns to date. However, upon inspection it’s clear the message of the video fails to connect with the value proposition of Invisible Children creating some rather uncomfortable disconnects. So. Overall success? Largely – the answer is no. KONY 2012 promises the arrest of Kony will improve the lives of the citizens of Uganda. In reality this is an egregious over-simplification and the arrest may actually make no difference at all largely due to the facts surfaced in the video quietly – that Kony’s group has mostly left Uganda and the security issue they cause has mostly been dealt with. Improving the lives of Ugandan children now requires improving access to education and jobs. These are mentioned, but with no exclamation. Why? This is a more complex issue and does not stick as easily in viewer’s minds so it is largely glossed over. The video also promises young people of the world a voice to affect change. The incredible success of the video brought a great deal of scrutiny to the campaign. When one of their target group attempted to “exercise her voice” by questioning Invisible Children’s operations they attempted to demerit the claim of high operations cost by stating it was made by a teenager, yet – they confirmed the claim. This disjointed response did them no favors. The claims left many wondering if Invisible Children were having a real impact, or if they were just another attention seeking organization preying on the thirst of their young audience to make a difference. 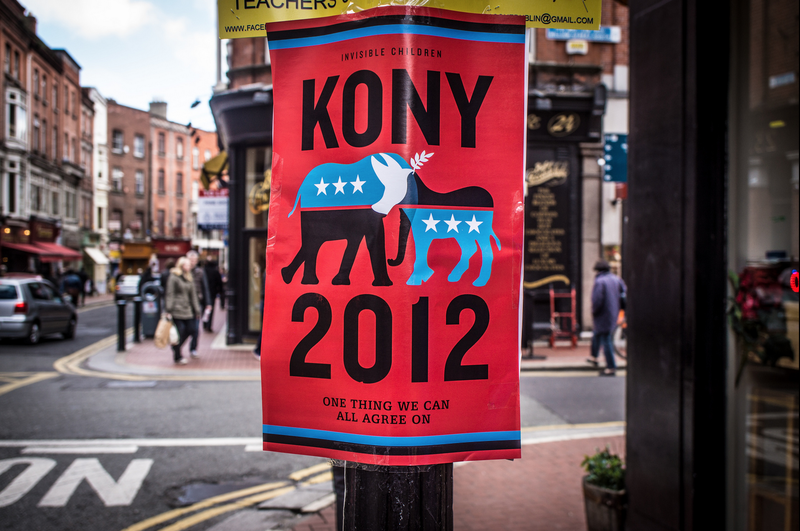 Invisible Children sought to renew their efforts in the wake of the dramatic and unfortunate controversy through the remainder of the Cover the Night campaign. Nearly anything would pale in comparison to the success of the original video. The balance of the campaign was essentially buried under the controversy in the media outside of several reports of violent activity further alienating remaining supporters. It’s difficult to take an issue as complicated and nuanced as the one that Invisible Children attempted to tackle in their KONY 2012 campaign. The situation in Uganda is complicated and the background there incredibly political and sensitive. But what they were able to do was bring the past and current issues in Uganda to light, and conceivably to a demographic that had historically been unaware. For that, and the increased conversation around these issues Invisible Children was perhaps successful. However, when marketing efforts fail to connect the organizations mission to the core guiding principles of their “offering” things go astray. Agree or disagree with the approach Invisible Children took, one thing is for certain – we can learn from it. This post was written in conjunction with Elliot Maltz, PhD and Professor of Marketing at Willamette University’s Atkinson Graduate School of Management. Maltz received his MBA from the University of California at Davis and his Ph.D in Marketing from the University of Texas at Austin. Prior to coming to the Atkinson School he taught for 6 years at the Marshall School of Business at the University of Southern California. His teaching interests include marketing management, marketing strategy, new product planning, sustainability management and supply chain planning. His research has been highlighted in Harvard Business Review, Journal of Marketing, Journal of Marketing Research, Journal of the Academy of Marketing Science, Journal of Business Research, Journal of Product Innovation Management, Journal of Business Logistics, Long Range Planning and Sloan Management Review. He has consulted and conducted workshops for a variety of concerns including: Texas Instruments, Hewlett-Packard, Johnson and Johnson, 3M, The Samsung Corporation, The Monitor Group, The Society for Competitive Intelligence Professionals, The Sony Corporation, Weyerhaeuser, and The Center for Telecommunications Management. Well written, although I think your post could have expounded on the “unfortunate” controversy. I still can’t quite figure that one out, but I believe there’s much more to this whole story than meets the eye. Yeah…I didn’t really think it was necessary to get to deep into that and it certainly wasn’t their biggest problem. There’s a link there that dives a little deeper into it.